What’s there to do in Calgary besides Stampede? 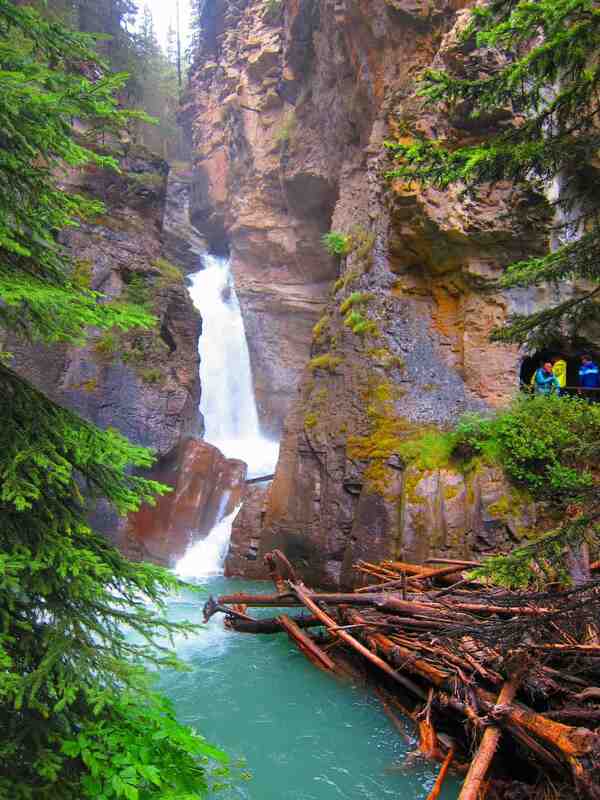 Visit Banff National Park!! 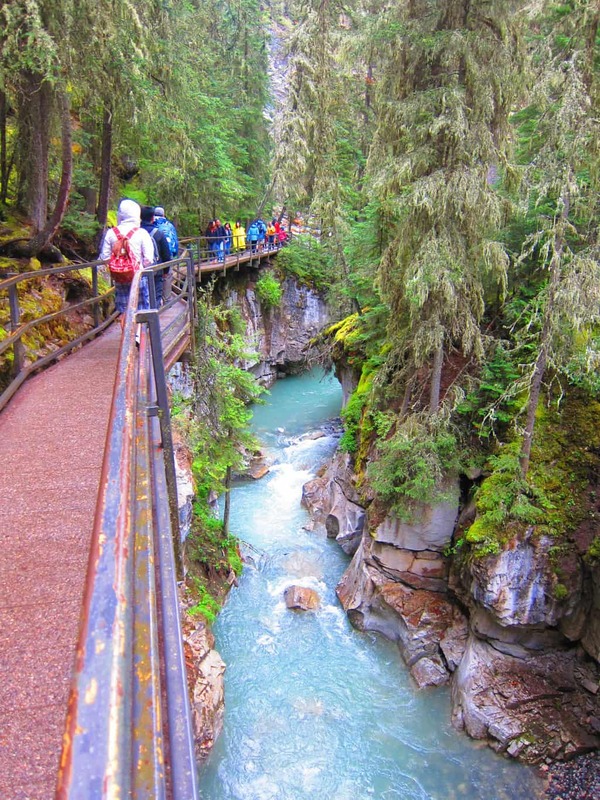 Only an hour away from Calgary, Banff is Calgarians’ favorite retreat from hectic city life. Last year, Kev and I drove to Banff and visited Lake Louise and Lake Minnewanka, and went further up north to Columbia Icefield and Glacier Skywalk. 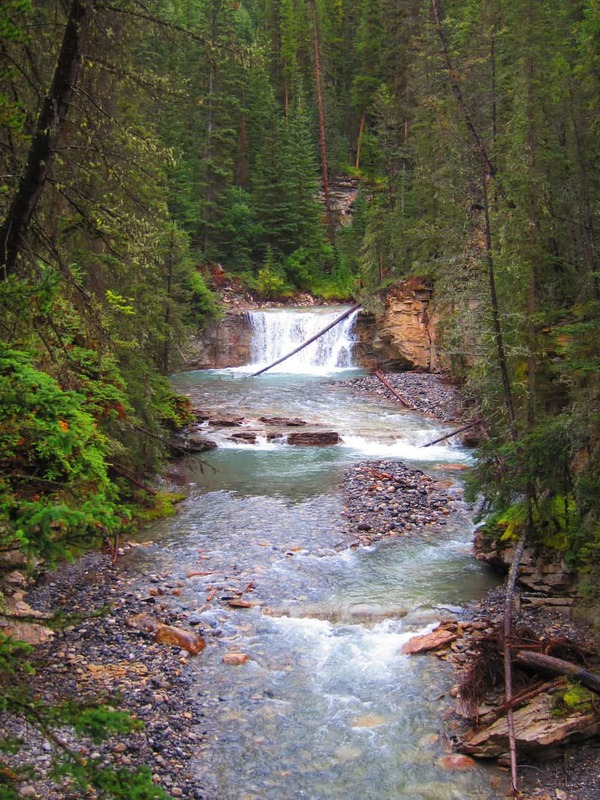 This year, I had been anticipating our summer trip to Banff ever since spring had arrived. With almost every weekend occupied, we managed to squeeze in a day-trip to cruise around Banff. 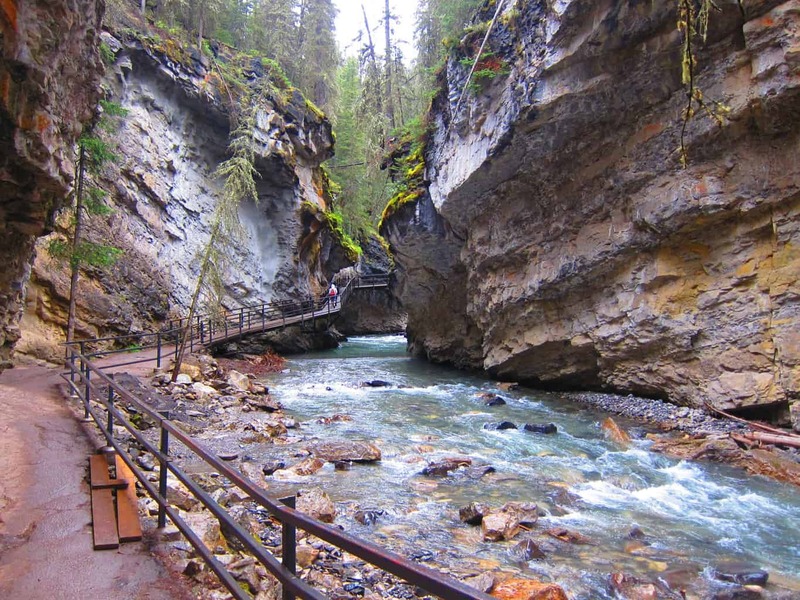 Few friends recommended Johnston Canyon on the Bow Valley Parkway (Hwy 1A), just 22 km from the town of Banff. 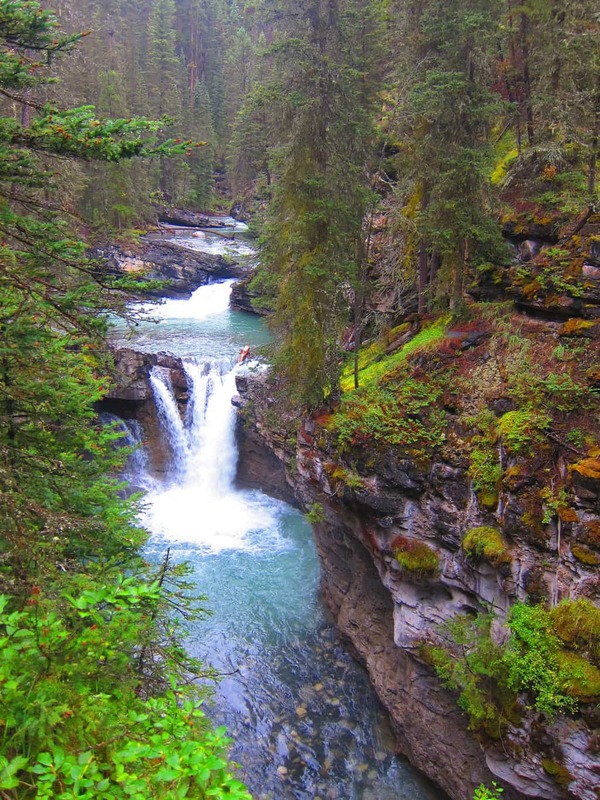 We planned a half day trip to hike along the trail and admire the magnificent waterfalls! 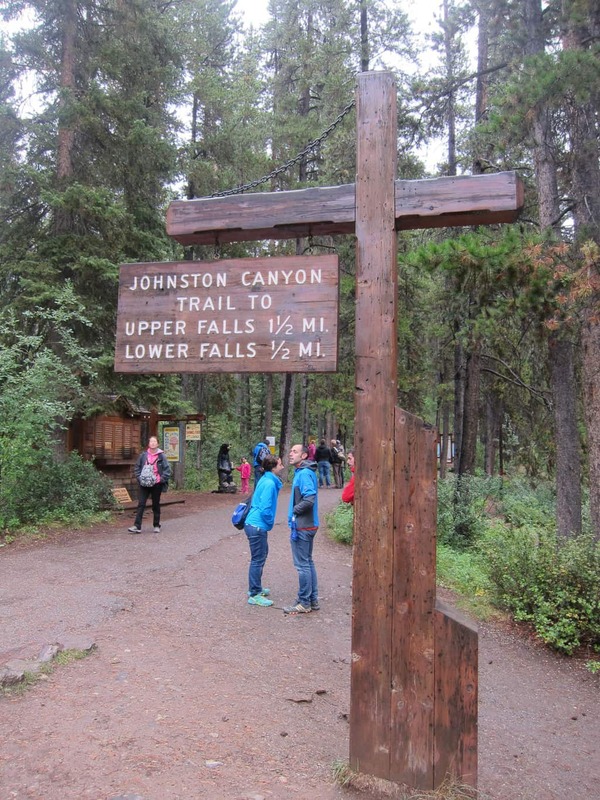 Where exactly is Johnston Canyon? How to get there? Take Trans-Canada Highway (Hwy 1) past Banff. After approximately 6 km, turn right onto Bow Valley Parkway (Hwy 1A). 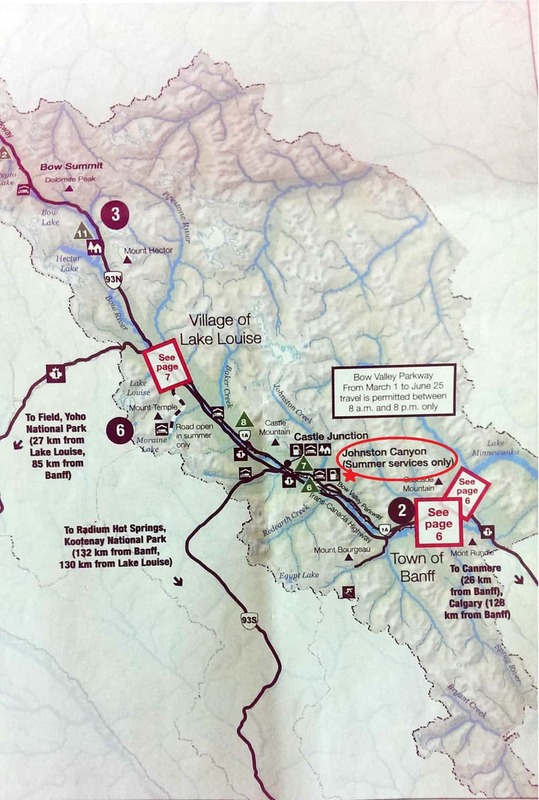 Drive another 17 km, then turn right into Johnston Canyon parking lot. 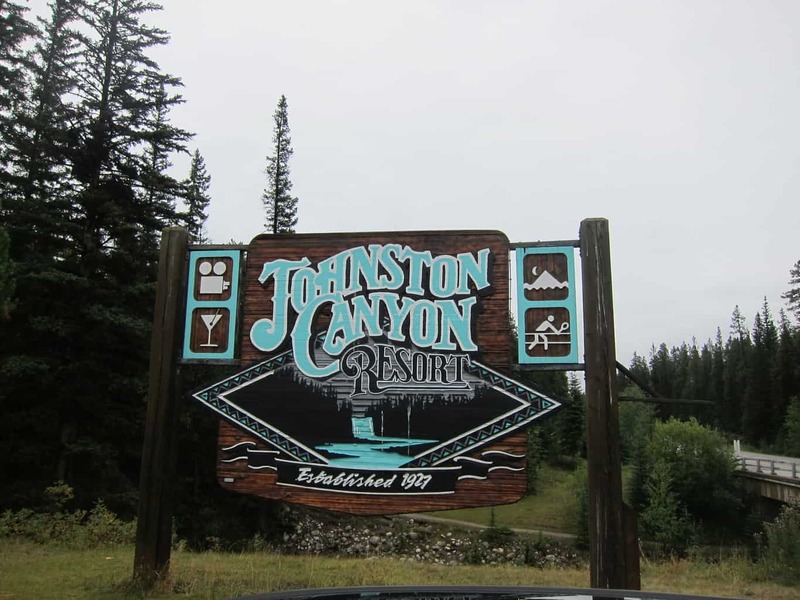 When you see the sign for Johnston Canyon Resort, you know you’re at the right place! 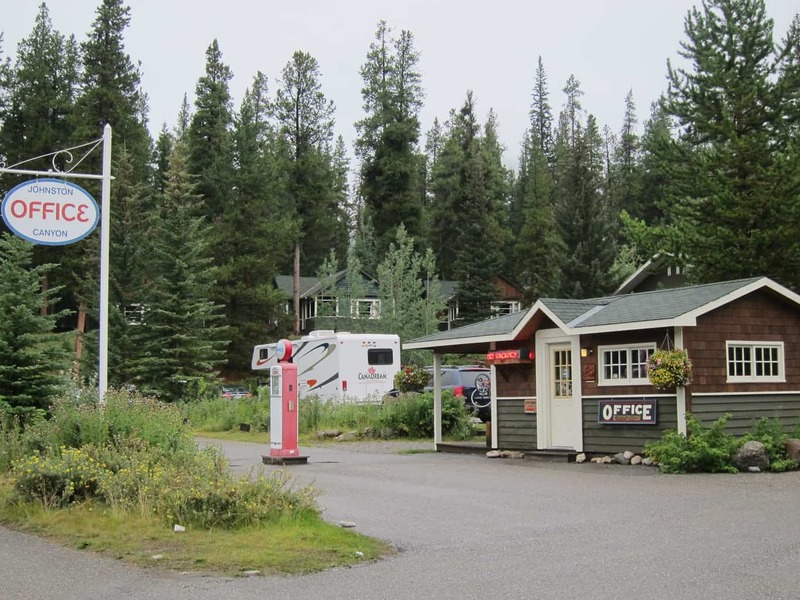 Turning into Johnston Canyon Office, you would find a parking lot as well as a restaurant, ice cream stand and gift shop at the base of the trail. 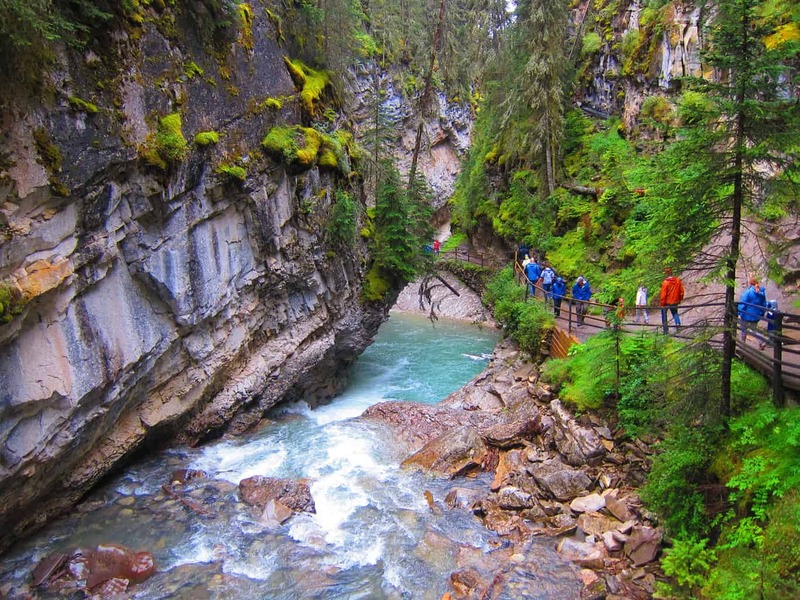 Johnston Canyon trail has to be the busiest at Banff National Park. It’s a super easy hike (with 3-year-olds on the trail, it has got to be! 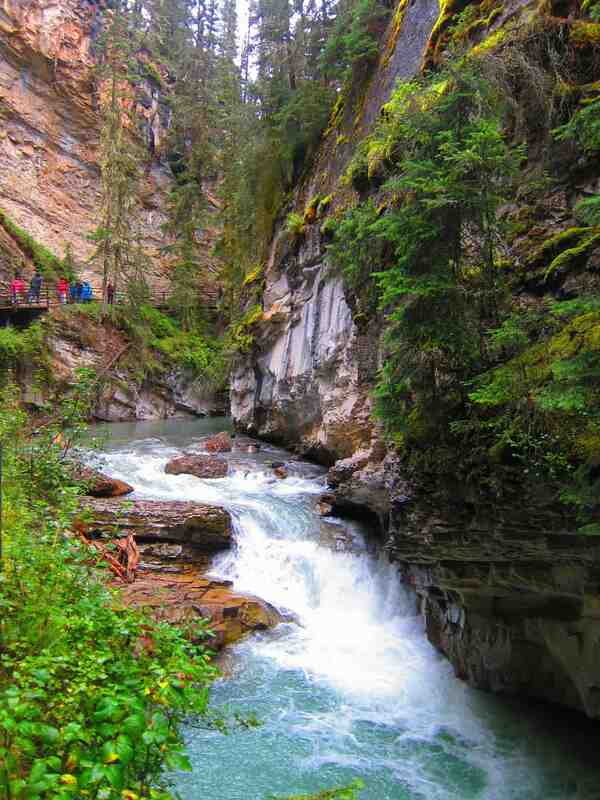 ), attracting hundreds of hikers everyday during the summer months. Normally, people would do the hike in the evening (after 4 pm) or very early in the morning (before 9 am) to avoid the crowds. Even on a rainy day (like the day we went), the parking lot was fully occupied so definitely add this to your Canadian Rockies itinerary! 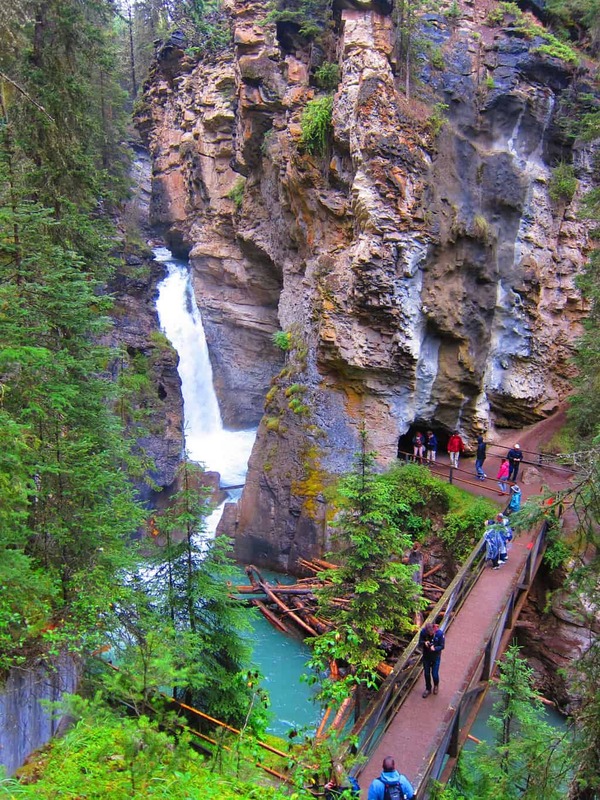 The well graded, scenic walkway winds its way through Johnston Canyon towards seven sets of waterfalls. 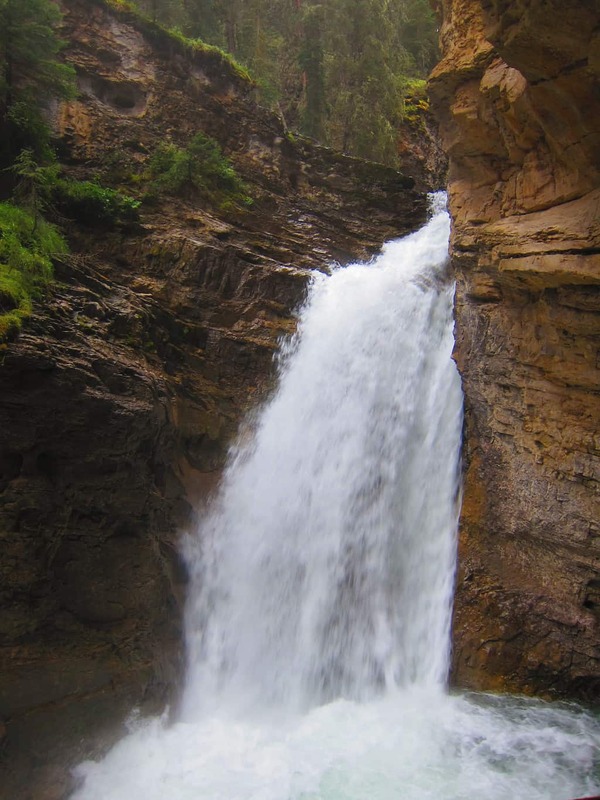 It takes about 1.1 km to the lower falls and 2.6 km to the upper falls. 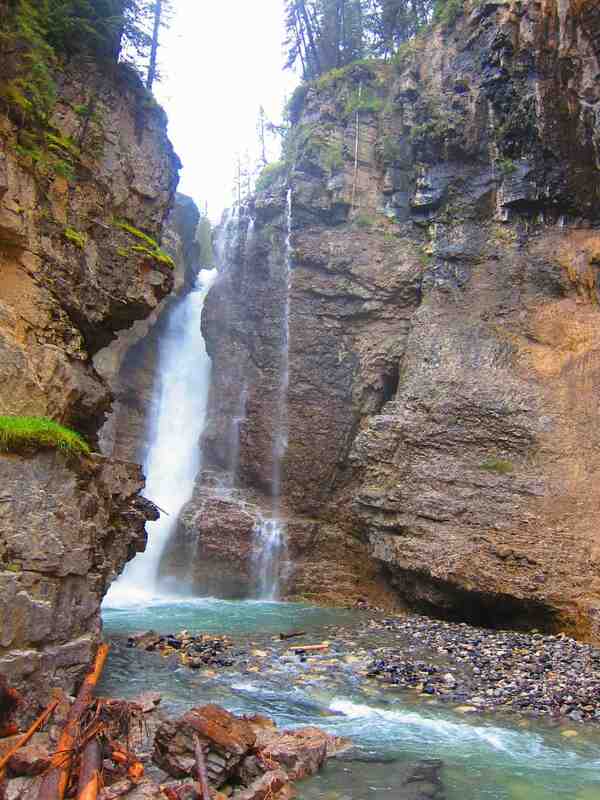 Allow 2~2.5 hours to complete a round trip taking in both the lower and upper falls. 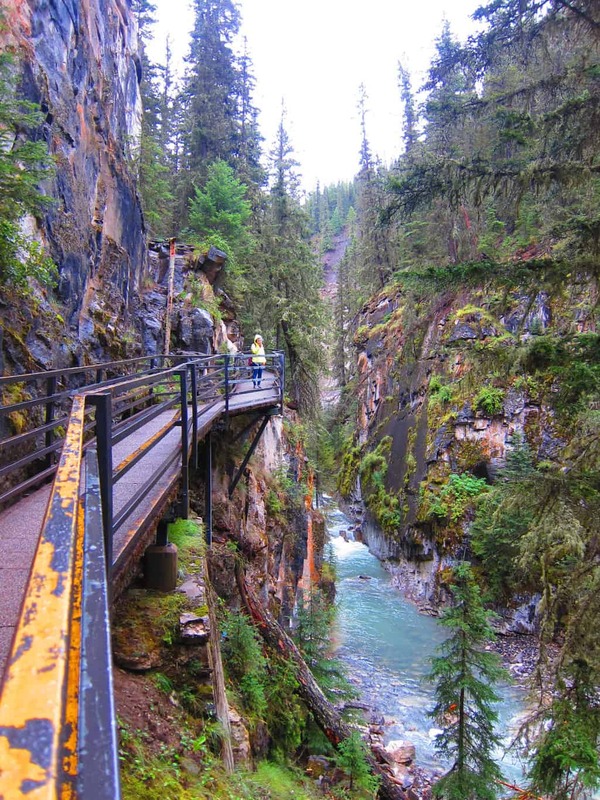 Let’s follow the canyon-clinging catwalks and cliff-mounting staircases to beautiful waterfalls! After an easy 30 minutes hike, we arrived at the lower falls. If you follow the trail to the limestone cave, you would be able to see the waterfall up close! Continued on, we saw some smaller waterfalls on our journey. Occasionally, there was a short steep climb., but nothing too crazy. 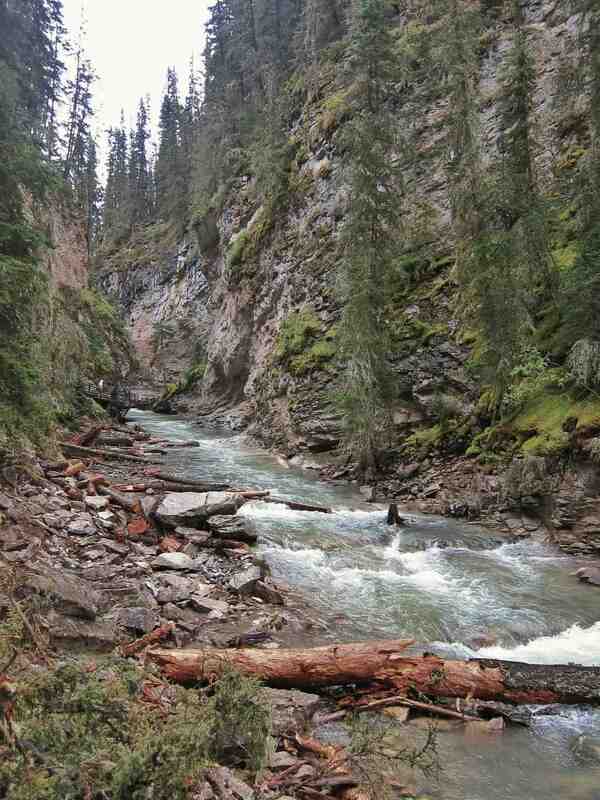 Breathing the natural fresh scents and and listening to the sounds of running water, oh the forest was so therapeutic! The yellow-tinted slanted rock marked the entrance to the Upper Falls 🙂 The trail took us to the top of the falls and a viewing platform. That concluded our hike! Despite the rainy weather, we enjoyed being in the nature. I was glad that we combated the rain and gave it a shot! 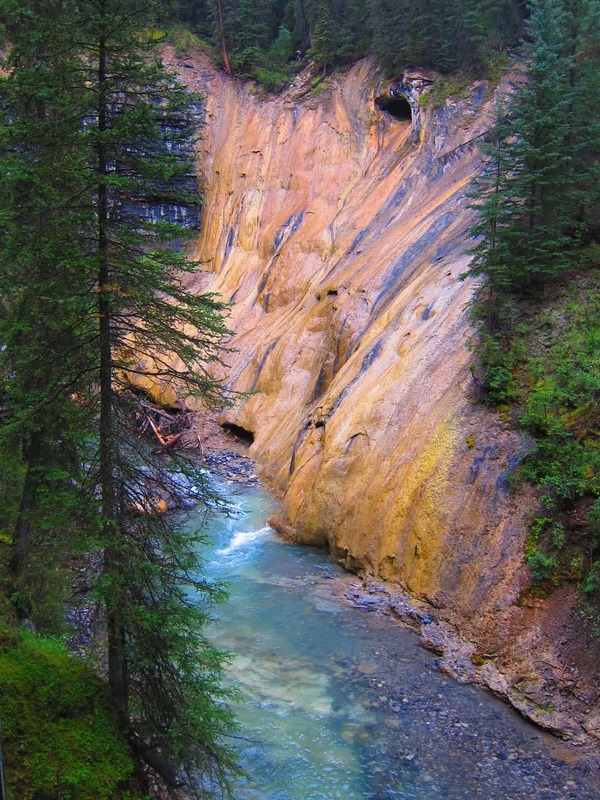 If you think the hike is too easy and want more “workout”, you can consider continuing on to the Ink Pots, which is another 3 km. Share some photos with me if you ever make it up there!! What a beautiful canyon. Gorgeous photos! Thanks, Corinne! It is our favorite place in Banff! Wow, gorgeous photos! 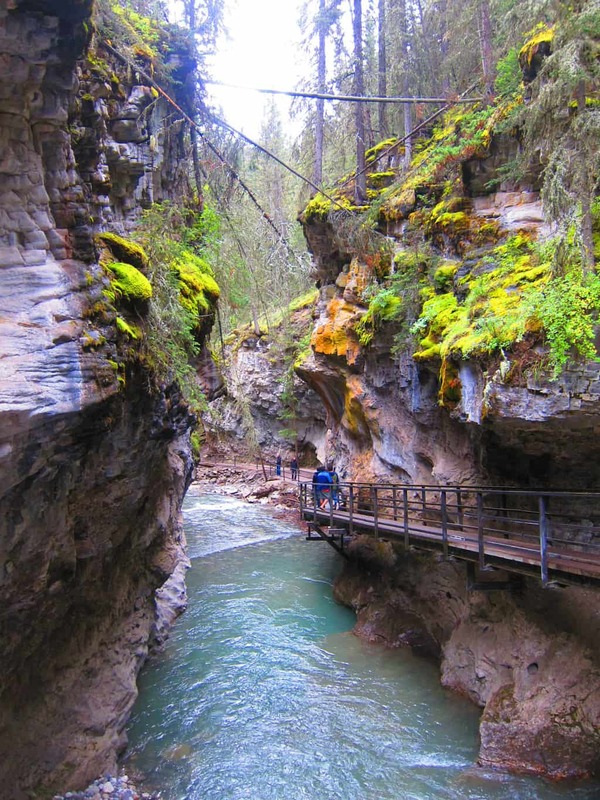 We’ve been to Banff once, but we didn’t get a chance to hike the Johnston Canyon trail. Aww, in winter it is beautiful as well, but you definitely need ice cleats to prevent sliding. I love the summer scenery too, so green and gorgeous!